Research has shown that calves from cows that shed their winter hair coat earlier tend to weigh more at weaning. Photo courtesy of Troy Walz. In the fact sheet they highlighted that cattle adapted to their environments tend to be more productive and profitable as they require fewer inputs and interventions. 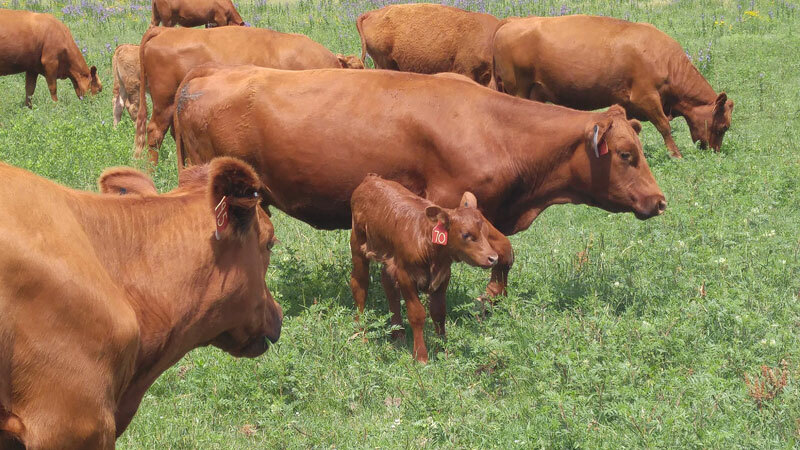 Bos indicus breeds of cattle as well as hybrids and composites having Bos indicus influence have both anatomical and physiological advantages that make them better equipped to deal with heat stress. The majority of Bos taurus breeds of cattle in this country originated from Europe where the environment tends to be more moderate in summer high temperatures than many areas of the United States in the summer. Even though that is the case, Bos taurus cattle can be selected for greater heat tolerance, allowing them to be more productive in environments prone to heat stress. One of the characteristics that Dr. Decker and Dr. Parish identified of cattle that are better adapted to handle heat stress is early hair coat shedding. Heat loss can be directly related to hair shedding. Hair shedding also can be an indicator of nutrition and immune status. Research has shown that calves from cows that shed their winter hair coat earlier tend to weigh more at weaning. Early research is also indicating that early hair coat shedding may have a greater influence on reducing heat stress than hair coat color. Fortunately, hair shedding is estimated to be a moderately to highly heritable trait and selection can be used to make genetic change. In the fact sheet they recommend visually scoring cattle hair shedding and then ranking them on a five point scale. A score of 1 indicates an animal that has a slick, short summer coat, while a hair score of 5 indicates an animal that still has a full winter coat. Scores 2 through 4 indicate varying degrees of shedding. Representative pictures of hair shedding scores are included in the fact sheet. Mid-May is identified as a being an ideal time to evaluate and score cattle on hair shedding for cattle producers in the Southeastern United States. The ideal date may be later for cattle producers further north. Once the eye is trained, hair scores are easy to collect and can be done as cattle pass through a chute or can be done while cattle are out on pasture. Cow-calf producers in hot and humid environments that are purchasing bulls and retaining replacements from those sires may benefit from using hair shedding scores in their selection process. Selection pressure can be applied directly to replacement heifers as well. Identifying cattle that shed earlier will help in selecting for cattle that are better adapted to hot or humid environments. For more information see the fact sheet Hair shedding scores: A tool to select heat tolerant cattle.